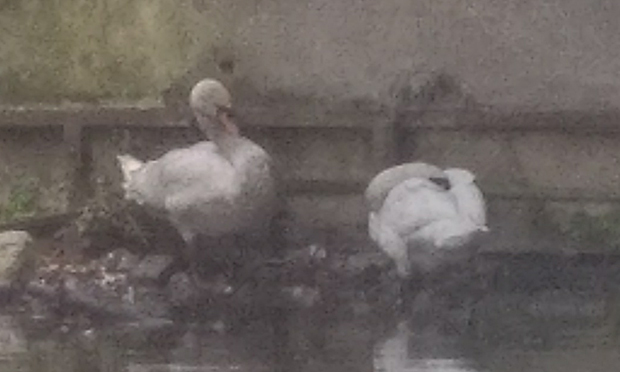 Two lovebirds have been separated by the River Lea oil spill – with volunteers only able to catch one of a pair of stranded swans in a rescue operation last night. The couple had been living together under a bridge for over a week, but wildlife charity The Swan Sanctuary said rescuing them has proved difficult because they kept “darting off”. The oil spill started last week but the government’s Environment Agency, which is investigating, has so far failed to find its source. Local boaters have been told to drop anchor until the river is clean, and waterways have been closed off between Tottenham and Hackney Wick. A number of oil-covered swans have been taken to the Swan Sanctuary in Surrey to recover. The charity’s founder Dorothy Beeson confirmed that the two stranded swans were mates, telling the Citizen: “We managed to rescue one of them last night. The other is still out there. Beeson said it has been a “manic week” for the sanctuary, adding: “We already have a flock of 40-odd swans who were rescued after a Christmas Day oil spill along the River Lea. She said all the swans rescued following last week’s spill are “holding up well so far, touchwood”, and joked that they might have to build another lake. Waterways charity The Canal & River Trust (CRT) is organising clean-up events on the River Lea and is on the lookout for volunteers. Groups of helpers have been using human hair, collected from local salons and stuffed into pairs of tights, to soak up some of the oil. An Environment Agency spokesperson said: “Our officers have been dealing with the pollution incident in the River Lea since it was first reported last week. “Our officers work 24/7 to protect people and wildlife from pollution incidents and have been working closely with the Canal & River Trust and a specialist contractor to identify the source of the pollution and clear the spillage.